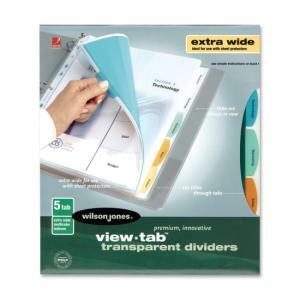 View-tab transparent dividers make your work stand out. Every aspect of this innovative organizational product is unique, from its premium look and feel to the clever see-through tab design that keeps all section titles in view for easy reference. View-tab dividers are durable, economical, and perfect for all your indexing needs. Durable transparent poly dividers won't tear or pull out. No clumsy tabs to print and insert. No tricky labels to print and apply. Does not require special paper or printer feeding. Economical because they can be used over and over. Convenient Web-based formatting is the fastest way to create custom results. Includes one clear cover sheet which protects table of contents, durable tabs, and one title page holder with unique design that keeps headers always in view.